Flow cytometric analysis of HeLa cells, using PP2A C Subunit (52F8) Rabbit mAb (PE Conjugate) (green) compared to Rabbit (DA1E) mAb IgG XP® Isotype Control (PE Conjugate) #5742 (red). 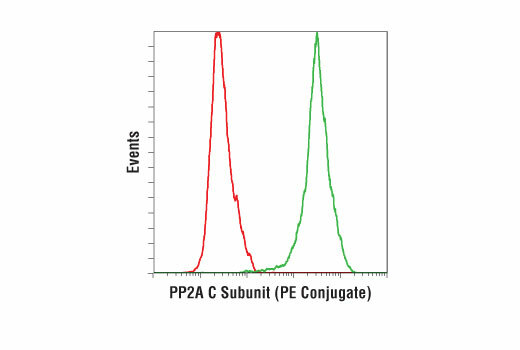 PP2A C Subunit (52F8D8) Antibody (PE Conjugate) detects endogenous levels of PP2A catalytic subunit protein (both alpha and beta isoforms). The antibody does not cross-react with other PP2A subunits. Monoclonal antibody is produced by immunizing animals with a synthetic peptide corresponding to the sequence of human PP2A C subunit protein. This Cell Signaling Technology antibody is conjugated to phycoerythrin (PE) and tested in-house for direct flow cytometry analysis in human cells. This antibody is expected to exhibit the same species cross-reactivity as the unconjugated PP2A C Subunit (52F8D8) Antibody #2259. Protein phosphatase type 2A (PP2A) is an essential protein serine/threonine phosphatase that is conserved in all eukaryotes. PP2A is a key enzyme within various signal transduction pathways as it regulates fundamental cellular activities such as DNA replication, transcription, translation, metabolism, cell cycle progression, cell division, apoptosis and development (1-3). The core enzyme consists of catalytic C and regulatory A (or PR65) subunits, with each subunit represented by α and β isoforms (1). Additional regulatory subunits belong to four different families of unrelated proteins. Both the B (or PR55) and B' regulatory protein families contain α, β, γ and δ isoforms, with the B' family also including an ε protein. B'' family proteins include PR72, PR130, PR59 and PR48 isoforms, while striatin (PR110) and SG2NA (PR93) are both members of the B''' regulatory protein family. These B subunits competitively bind to a shared binding site on the core A subunit (1). This variable array of holoenzyme components, particularly regulatory B subunits, allows PP2A to act in a diverse set of functions. PP2A function is regulated by expression, localization, holoenzyme composition and post-translational modification. Phosphorylation of PP2A at Tyr307 by Src occurs in response to EGF or insulin and results in a substantial reduction of PP2A activity (4). Reversible methylation on the carboxyl group of Leu309 of PP2A has been observed (5,6). Methylation alters the conformation of PP2A, as well as its localization and association with B regulatory subunits (6-8). Janssens, V. and Goris, J. (2001) Biochem J 353, 417-39. Zolnierowicz, S. (2000) Biochem Pharmacol 60, 1225-35. Millward, T.A. et al. (1999) Trends Biochem Sci 24, 186-91. Chen, J. et al. (1992) Science 257, 1261-4. Turowski, P. et al. (1995) J Cell Biol 129, 397-410. Lee, J. et al. (1996) Proc Natl Acad Sci U S A 93, 6043-7. Tolstykh, T. et al. (2000) EMBO J 19, 5682-91. Yu, X.X. et al. (2001) Mol Biol Cell 12, 185-99.